My family is originally from the northern Vietnam city of Nam Dinh but moved to Saigon in 1954 after the Geneva Accords divided the country in two. As part of the Operation Passage to Freedom, the US and France helped transport close to a million northern Vietnamese to the south after this division. Kim’s family however, is from the south central city of Quy Nhon. So we both have regional differences in our tastes and knowledge of Vietnamese cuisine. Lately I’ve introduced several northern dishes to Kim, such as bun thang, and now we like to share another great northern noodle soup call bun moc. 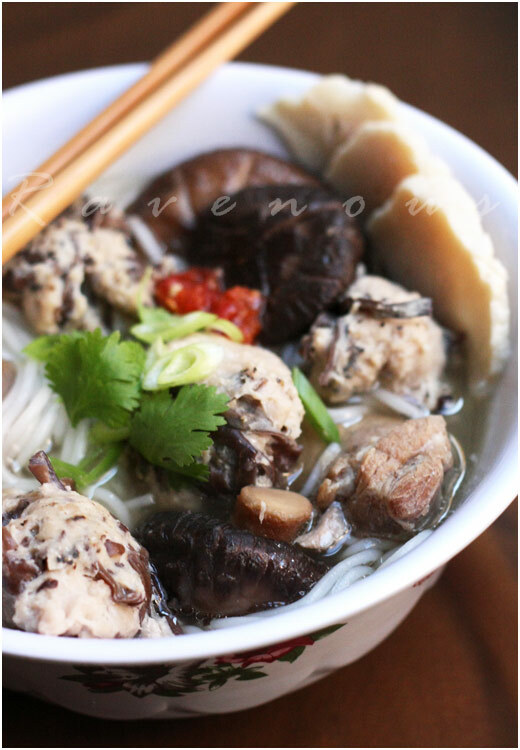 Bun moc is a vermicelli noodle soup made from a pork and shiitake mushroom infused broth. 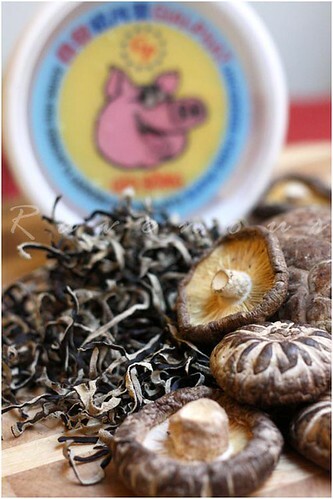 The meats commonly include pork paste balls made from gio song (raw pork sausauge), cha lua (pork sausage—which is gio song that has been wrapped in banana leaves and boiled). Taken all together, this is a delicious, earthy, yet light noodle soup that’s very popular in the northern parts of Vietnam, but can also be found throughout the country. Unlike pho or bun bo hue, this soup is not as time intensive and is really easy to prepare. In large stock pot, place the pork ribs/bones with enough water to cover and bring to boil for about 5 minutes or so. The gunk will surface from the ribs. Empty the water and wash the ribs/bones with cold water. Also wash the pot to get the residue off the side or have a second pot with hot water ready. Place the cleaned ribs/bones into the pot and cover with about 4 qts of water or so. Bring to boiling again, occasionally skimming any left over residue, and turn heat to low and simmer. In the meantime, soak the wood ear fungus and shiitake mushrooms in separate bowls of warm water for about 15 min. Remove the woodear fungus, squeeze out the water and coarsely chop. Mix this along with the black pepper into the pork paste and set aside in the fridge. Boil another pot of water to make the vermicelli noodles. Cut the cha lua, scallions, and cilantro and set aside. After simmering the stock for about 1. 5 hrs, add the shitake mushrooms along with the water it was soaked in and continue on low heat for about another 30 minutes. Season broth with salt and/or fish sauce. Both the pork ribs and shitake mushrooms should be very tender. If you used pork bones, you can strain and discard. When you’re ready to serve, bring the pot to boil again and use a wet spoon or wet hands to form small pork paste balls and cook in boiling broth–about 3-4 minutes or so. Ladle the soup with tender ribs, shiitake and pork paste balls over vermicelli noodles and serve with beansprouts and dab of chili garlic. 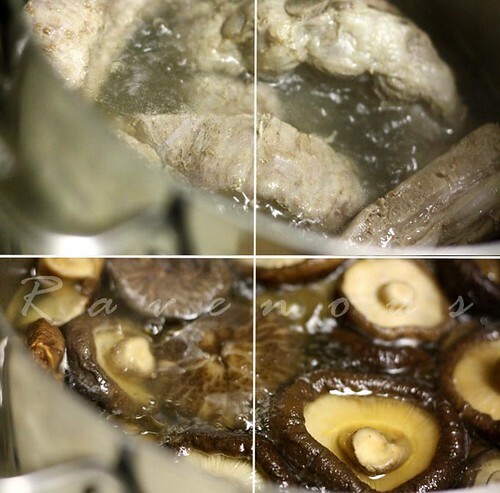 The shiitake mushrooms soak in the sweet pork broth and is so juicy and delicious. Bun moc is such an earthy but still light northern Vietnamese vermicelli noodle soup that we love to enjoy and hope you enjoy it too! i just love Vietnamese noodle soup dishes and this looks delicious! Looks great. I love noodle soups, and those photo's are great! 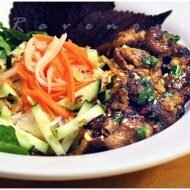 Bún thang and bún mộc are dishes from my childhood! I have made the former many times, but not the latter. Thanks for the recipe! Georgeous photos, as usual! MrsLavendula: if you love mushrooms, you'll love bun moc! Andy: Thank you! 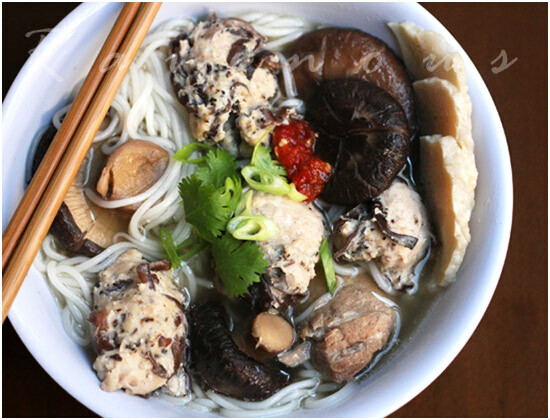 Bun moc is great if you enjoy the earthy flavors of mushrooms. 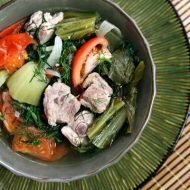 French Accent: The broth for both bun moc and bun thang are really similar. Let us know if you try bun moc and how it goes! nikki:you're right–bun moc is fairly mild soup we love to eat for breakfast. But nothing like working out the kinks with some chili for breakfast! Can't remember where i had them, but I love the meatballs with the woodear in them. I'm totally going to have to give this one a try. This looks awesome. This could be one of my comfort foods. But I don't see any pork paste in the grocery stores and not so familiar with pork sausage loaf. Is that the white item with brown specks that look like fish balls? Sounds like a wonderful soup! I would love the delightful mushroom flavor! divina: the pork paste is sold in a plastic container and labeled "gio heo" and often near the fish paste. The cha lua is either wrapped with banana leaves or aluminum foil. If you can't find the cha lua, it's not essential to bun moc. 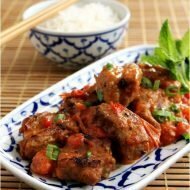 5 star foodie: the mushroom flavors do shine in bun moc! anonymous: thank you!! so glad you enjoyed it!! wow, 10 out of 10 is high praise!! my favorite BUn moc restaurant is a place near New world hotel, Hochiminh city. Great dish. hey guys, can I make my own pork paste with ground pork? If I can, what is the ingredient for it?